The era of internet is quite a day-to-day handy thing in our lives. It’s like along with the three basic necessities comprising of Food, Shelter and clothing we also have one more that can be added, i.e. Internet. Isn’t it? As, the topic suggests many of, infact most of our Indian people are tele-communicating with their near and dear ones with Samsung mobile phones. The major mass is using the Android OS in our country including others. We have seen many tutorials or say many tricks of Android OS which can help manage our wireless networks but what if I ask you to manage the vice-versa thing? Yes, I am talking about How to use wireless network to manage android? We all love to travel isn’t it? To be precise, we need to travel and hang out with friends and family with an online presence along with an off-line celebration. So, to make this thing possible what you can do is have access to WiFi networks for which all you need to have is a WiFi-enabled laptop or any of the other devices like cell-phones, iPads or any other tablets (not to forget it must be switched ON). Well, why we are emphasizing more on using WiFi than of the mobile networks then? Well, the point of doing so is that WiFi has got more faster and efficient connections as compared to your mobile networks and most importantly it saves your power. Let me brief out the explanation. Whenever you use your mobile inter-networks what happens is that it starts consuming your battery at a faster rate especially when you tether it and make a portable WiFi-Hotspot for any other devices to connect it to you. So, now when you convinced with the fact that WiFi is a better option still, you are having some technical issues with it which makes you irritated by a WiFi Manager. So, let me provide you a cool application, i.e. a desktop application to solve all your problems related to the same. The application is Desktop WiFi Manager for Android – Wondershare MobileGo for Android. What is Wondershare MobileGo for Android? Wondershare MobileGo for Android, is the master key to solve all your problems realted to the WiFi and Android. 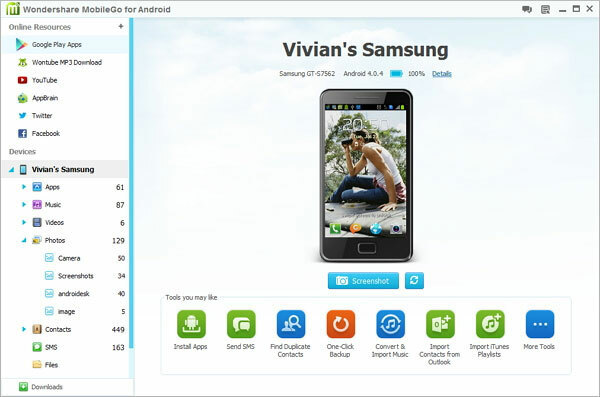 It is a desktop based application to manage your Android phone. So, basically you are going to get a manager who will manage your phone while you will enjoy your pop-corns. What is the best part of Wondershare MobileGo for Android? The best part is that while you are busy operating and doing all the stuffs with your desktop, you can simultaneously add one more task that is to manage your Android phones through your desktop itself. 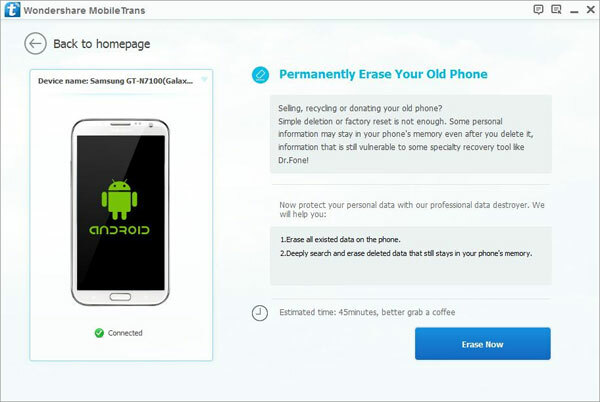 You can transfer your data, backup and organize your media, contacts (the most important ones) and apps on Android phone and tablet at your ease and comfort. Yes, it is very obvious that the first option i.e. connecting your phone through USB is the simplest way where you will be following an on-screen wizard. Whereas the Wifi will require an apk file to be installed in your Android phone and do the rest part. Step 1. : You will require to install the application on your Android phone from Google Play. So, sign in to your Google Account. Step 2. : You will search/browse for Wondershare MobileGo, and you’ll find the option of install where you’ll click on install to download the MobileGo.apk file on your phone. Few more ways to install or say download you can find it out here : Click Me . That’s it. You’re done. Enjoy managing your change through the experience of wide screen. When you are done with connecting your phone or any other device to your computer through WiFi, everything i.e. each and every data will be handy for you. When you’ll open the application you’ll find a sidebar on the lefthand side of your app. By clicking on Contacts, Music, Video, Apps, Photos, SMS, Files tab you’ll be headed to a corresponding window. After this you can add, export, delete files. So, that was a little but useful about Wondershare MobileGo. How to Determine Authenticity of an E-Commerce Website? nice review. with this software. networking with android will be much easier. also does it work on windows XP? Seems quite impressive,would surely try it out sooner or later. ITunes Music to Android, that is really impressive. Thanks Charmie. Thanks for this informative post, I started using mobilego when I purchased my galaxy note3 and this is the best phone manager. Using the mobile app with this pc software is so easy and take two seconds to connect over WiFi. I have never had a problem connecting over WiFi,. This is the best app to completely manage your phone and keep everything backed up. It’s nice to be able to control your texts and calls while working on your pc. Thank you very much for this useful article. You are explained very well. Your post helps me a lot. Sure i will come back for more updates, keep updating useful stuff like this. Nice article, I was looking for some review with respect to this app. Mobilego really looks interesting.